From the cult classic Nightmare on Elm Street movies, this clothed action figure is based on Freddys tuxedo appearance in Dream Warriors!Freddy stands 8" tall and is fully poseable. 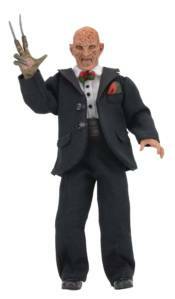 Hes dressed in a fabric tuxedo with red and green striped bow tie and pocket square, and comes with a replica model of the Elm Street house that lights up. Blister packaging with resealable protective clamshell features custom artwork created by Nathan Thomas Milliner just for this release!